This year the girls and I made The Count a Framed "Daddy" Collage for Father's Day! You don't have to be super crafty to do this and it makes a nice keepsake for dad. We did this all today, so you still have time before Sunday to make your own! Large Paper Mache Letters -- You just need one D, one A and one Y or just a D and an A for Dad or a P and an O for Pop-Pop -- I got mine from Jo-Ann's. Paint -- I started to used spray paint but it wasn't covering very nicely, so I switched and used acrylic. That's just what I had on hand. I'm sure poster paint would work just fine too. Smiling Children -- I had to bribe mine with fruit snacks and even then getting them to smile, hold up the letter, and look at the camera all at the same time was a bit of a challenge. Collage Frame with the appropriate amount of openings -- I couldn't find a frame with five openings in a straight line, so I went with the six and gave my kids a heart I cut out of card stock to hold for the last photo. I bougth my frame at Michael's don't forget to use your coupons for 40-50% off! Here's what the letters look like before you paint them.  Copy heart into MS Word, enlarge, print and cut out. Paint your letters and let them dry. Cut a Heart Out (if necessary) out of your card stock. I'm not the best free-hand drawer or cutter, so I enlarged this heart in a word document and printed it out on my card stock first. Then I cut it out. Now you're ready for your photo shoot. Take a few shots of each child holding each letter, so you can choose your favorites for the frame. Get your chosen photos printed. If you order through snapfish.com or shutterfly.com, you can usually pick your photos up locally within an hour or so. Add your photos to your frame and Voila! You have a wonderful Home-made Father's Day Gift. This is really cute and anyone's father would be so happy to receive such gift. Why didn't I think of this, well thanks alot for this and hopefully I can make something similar next year. Those poses are cute. I bet her daddy loves those pictures. Such a creative idea. Counting On Me is Now on Facebook!